Our team consists of Certified Customs Specialists (CCS designates) who have passed a lengthy examination based on Canada Customs rules and regulations. This proves that they have the knowledge necessary to be experts at what they do. Customs clearance is a very time sensitive business and we take great pride in every shipment we clear. Interruptions to your business can prove costly. We ensure there are no delays in the customs clearance of your shipments. With us, there are no extra complex fees! Some customs brokers are known to add additional fees such as line fees, PARS fees, EDI fees, cod fees, etc. With our flat customs brokerage fee you know exactly what you are paying. Ron at Urban Manor imports goods from the U.S. and overseas. We have reduced Urban Manor's customs brokerage fees significantly. We have been saving Urban Manor over $500 a month off customs brokerage fees. Urban Manor is happily putting their savings towards further marketing their brand. These days, even government agencies have to find some type of savings. We have been clearing OPP shipments through customs and saving the department quite a bit off clearance fees. We feel that if Ontario Provincial Police can trust in our customs brokerage services, why not you? After switching over to us from their previous customs broker, we saved them over $50.00 per shipment. They usually have over 50 different products on most shipments- which they were being billed for extra line fees from their previous broker. In comparison, we charge a flat clearance fee. No extra line fees are added. Importing various garage door parts from the U.S., Gene has found our services to be of great value. Gene at Hardline Overhead Doors was paying roughly $70.00 for a shipment of parts valued at $250.00. Paying that much for customs brokerage fees on a low value shipment made Gene search for a better option. Through a reference, Gene came across our customs brokerage services. Passion Sports orders supplies from the U.S. which were simply costing too much. They were being charged extremely high brokerage fees by their previous customs broker, which is also a large courier company. Since 2011, we have been clearing their goods through customs without any delays to the courier company's (UPS) delivery times. Receiving toy and educational supplies from the U.S. was becoming very expensive for Roger at Librarie Moderne. The many different types of products amounted to line charges and CFIA/OGD fees (from their previous broker), which doubled their clearance costs. We were able to offer Roger a flat clearance fee which has amounted to huge savings. Growing Kids has saved 50% off clearance fees since becoming one of our valued clients. Originally, they were a bit hesitant to switch because they had never heard of our services. However, they were extremely satisfied after the first few shipment and now recommend our company to their business partners. What does “Licenced by the Canada Border Services Agency” mean? As a customs broker, we are experts in going through various tariff treatments and HS Codes to figure out which one applies to your goods. It is a tricky process and we are here to help. Give us a call or email us at cs@baycitybrokers.com and we will be glad to assist you with any duty questions. What is a customs broker ? A customs broker helps you through the complexities of duties, taxes, rules and regulations for your shipment. A customs broker is licensed to collect any taxes and applicable duties on behalf of the Government of Canada. Only a licensed customs broker can act as your agent when dealing with Canada Customs. What kind of duties will I be paying on my shipment ? As a customs broker, we are experts in going through various tariff treatments and duty rates to figure out which one best applies to your goods. It is a tricky process and we are here to help. Give us a call or email us at cs@baycitybrokers.com and we will be glad to assist you with any duty questions. How long does it take you to update my U.S. suppliers of the change in customs brokers? We update your suppliers the same day we set up an account for you. Suppliers are notified via email or fax about the change in customs broker. Will there be any delays in the clearance of my shipments if I chose to use your services instead of my current broker? Absolutely not. While your suppliers update their records to show us as your new customs broker, your existing broker will still be clearing any pending shipments. I am hesitant to switch in case something goes wrong. Can we start out with you handling only one of our supplier’s shipments? This way we can try your clearance services before switching over all of our suppliers. Of course! We understand that you may be skeptical at first, so instead of updating all of your suppliers, just let us know which U.S. supplier you would like to try our services with. Stay competitive with our flat customs brokerage fee. Avoid those pesky extra fees. Importing equipment or parts can be very time sensitive. Speak to our dedicated team. Suppliers located in other countries? Looking to bring in a new line of goods? We can help. Stay on top of trade rules and let us help you avoid costly penalties. Clearance delays can lead to costly storage penalties. Avoid delays using our seamless service. Time sensitive parts importations are crucial to your supply chain. We understand. Require customs brokerage services for a large project? 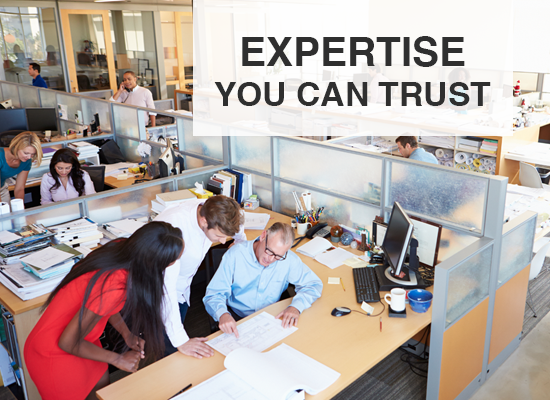 Count on our expertise.